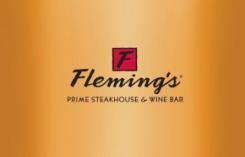 Fleming's Prime Steakhouse & Wine Bar is an ongoing celebration of exceptional food and wine. Indulge yourself with the finest aged prime beef and discover new tastes with our award-winning wine list, featuring 100 wines by the glass. Known for its warm, inviting ambiance Fleming’s features an open dining room built around an exhibition kitchen and expansive bar. Adjacent to the main dining area are private dining rooms that can accommodate small or large groups. Fleming's lively atmosphere, gracious service and dedication to excellence turn evenings out into memorable times.